Camo, short for camouflage, is often associated with outfits or protective gear worn by police and military personnel to conceal themselves out in the wild. In the wedding industry, however, the camo trend depicts the use of common colors you see in nature like green, oranges, yellows, even pinks, and purples, and then combining these to recreate a sunny countryside wedding. So, if you are on the lookout for one of a kind camo wedding invitation templates, you are in the right corner of the internet. In this article, we provide more information on how you can correctly select the best wedding invitation template that will match your camo themed wedding. Also, fifteen printable camo wedding invitation templates are embedded in this article. Check them out below! You may also see invitation examples. 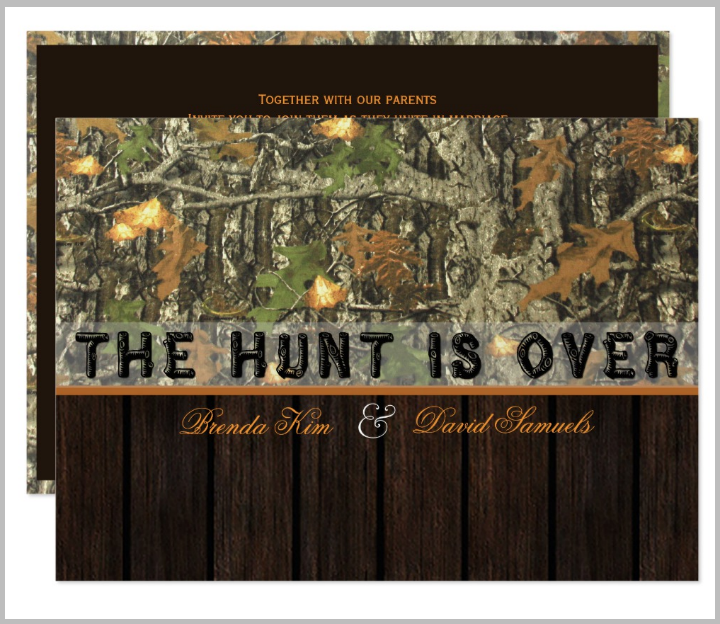 Here are the Camo Wedding Invitation Templates! Attached below are different camo wedding invitation card templates that any couple or wedding planner may use as their own wedding invitation. As a reminder, do not forget to install a compatible graphic design software program on your computer before you download and edit these pre-made templates yourself. Selecting a wedding invitation template for a camo-themed wedding is far simpler than having to create your own handmade greeting card. 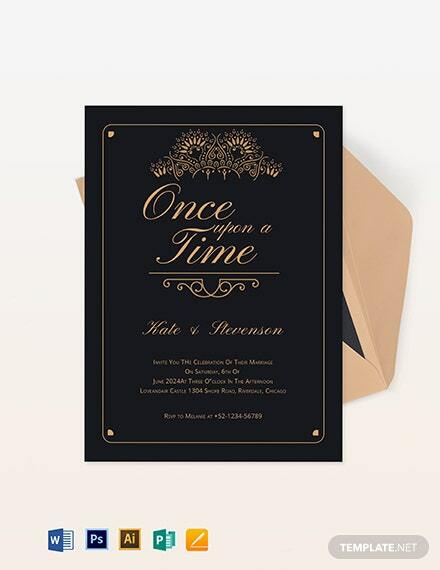 But, just like learning how to create a greeting card, you should always establish a set of criteria to follow by before you choose and purchase any type of invitation card template. One of the most important features of any pre-made template that someone planning a wedding should look for is its customizability options. 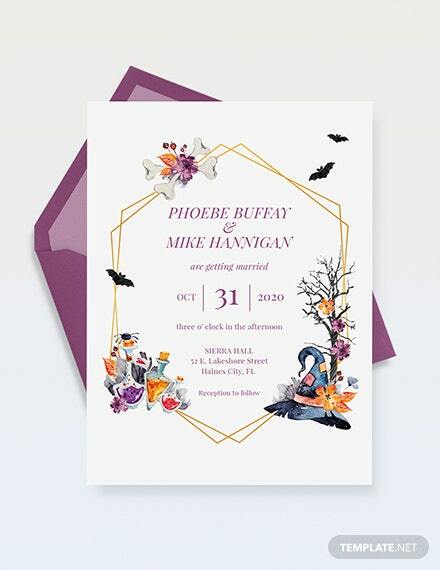 As the end-user of a wedding invitation card template, you need to make sure that you can properly edit any given invitation template to your satisfaction. To do this, you need an invitation card template that can be opened and edited on a compatible graphic design software program. Before purchasing a camo traditional wedding invitation template, for example, you need to know the kind of file the printable template is being stored as. 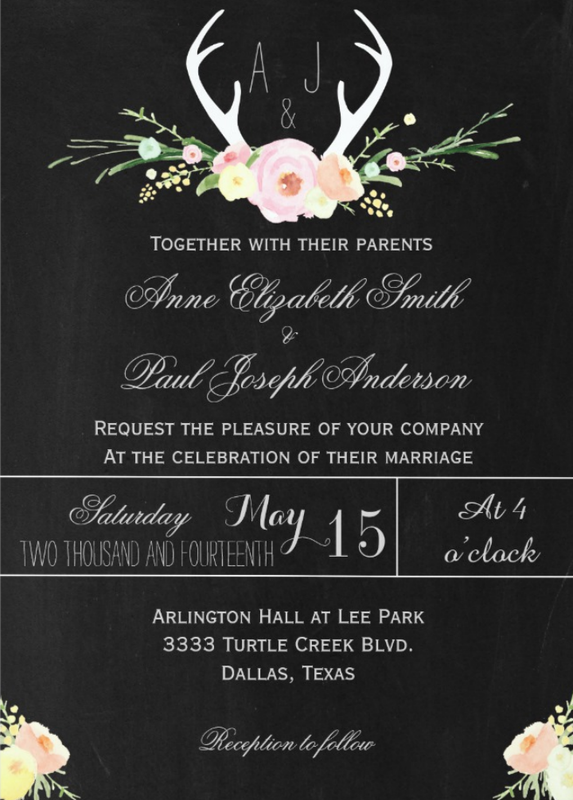 If the invitation card template is stored as Photoshop template, then you will need to have Adobe Photoshop installed on your computer. In addition, by finding out the level of customizations allowed in a printable card template, you can plan what you want to remove or add to the template design ahead of time. 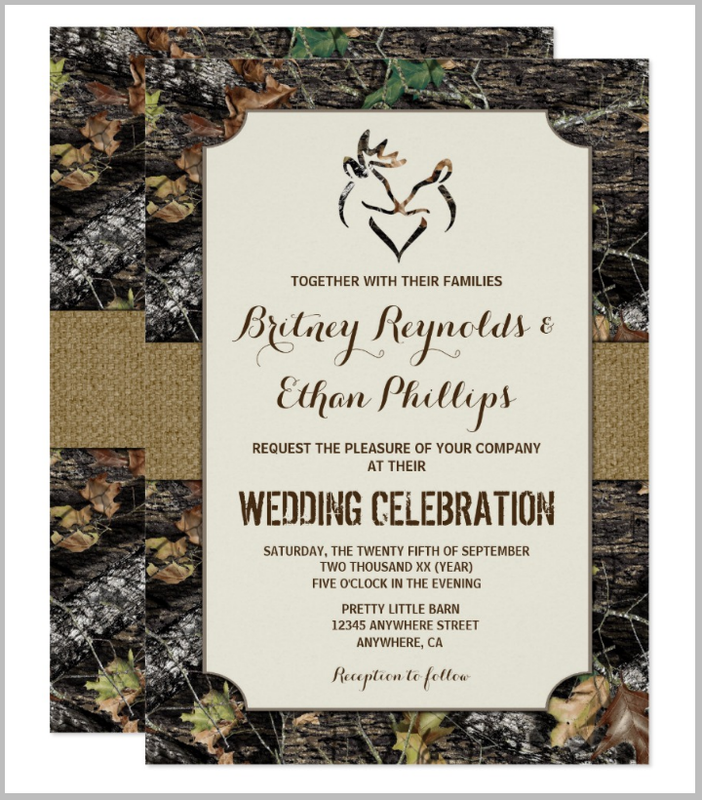 So, if you found a camo invitation template that suits your wedding theme but you want to add more grungy patterns or if you want to use a different free font style, you should go for an invitation template that is available in Photoshop or InDesign file formats. 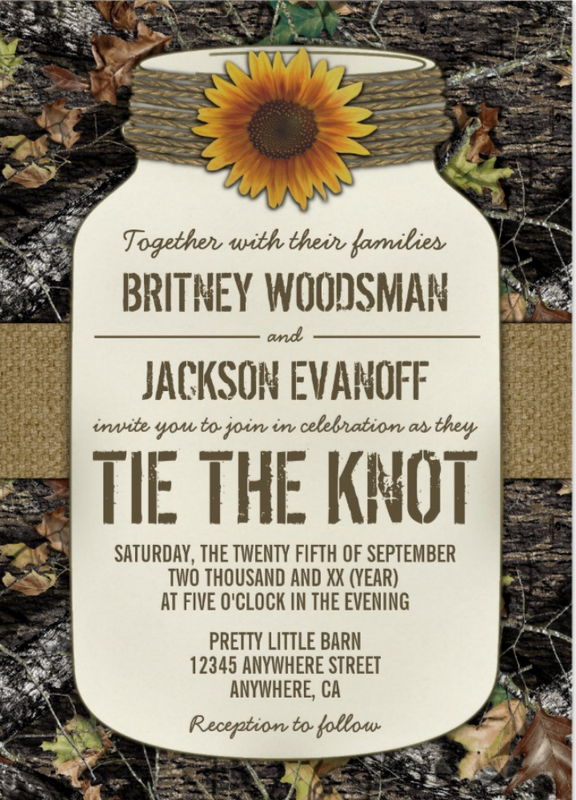 On the flip side, if you are satisfied with a camo invitation’s color scheme and other design components and you do not wish to make changes to the template aside from writing down your own wedding details, then you may choose any PDF or Illustrator templates for creating an invitation card instead. 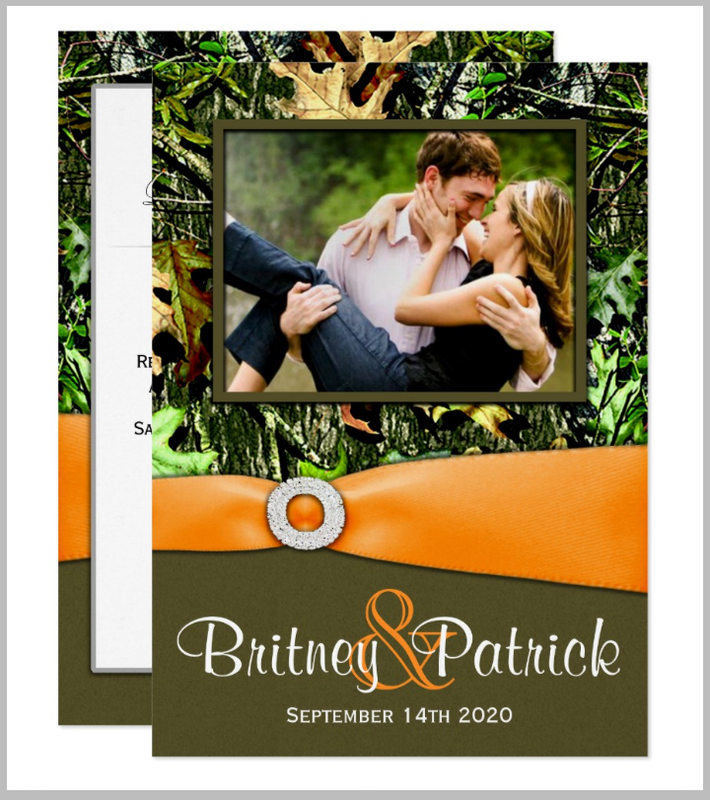 The next factor that couples and wedding planners should look into when choosing a camo wedding invitation template design is the amount of time they have for editing a template. Know that different types of pre-made templates will require different editing skills. Moreover, these printable invitation templates will also be stored as different kinds of templates and that will add to the level of difficulty in editing them. If you are on a tight schedule for your upcoming wedding, you may have to reconsider using these printable camo invitation templates. What you may do instead is to delegate the task to a professional graphic artist or to any friend or relative who is knowledgeable in graphic design. But, if you have more than six months to do before the wedding, you may have ample time to customize the template yourself. It is for these extenuating circumstances that you should be mindful of your schedule before you purchase a camo wedding invitation. And, planning a wedding can be draining even if you have hired a professional wedding planner to do the job for you. So, if you are not confident with the amount of free time you can have to edit printable wedding templates, then it is better to delegate the task or not use pre-made wedding invitation card templates at all. 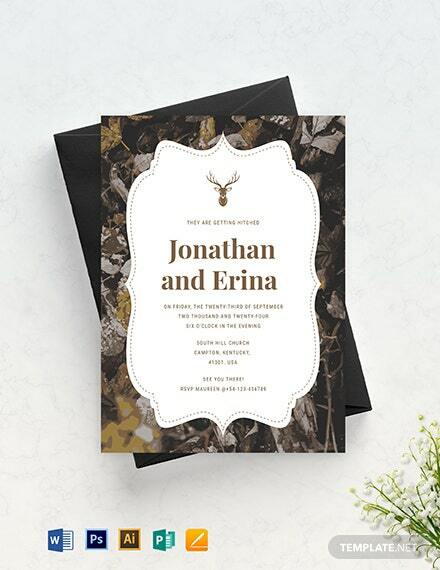 Next on this list of things that you should consider before purchasing a camo wedding invitation template is your wedding’s official theme or motif. Of course, you can say that you are having a camo-themed wedding. But, know that there can be different variations of a camo wedding theme. To illustrate, you may choose between different shades of greens, oranges, reds, pinks, and yellows and whip out an original wedding color palette. So, if you are picking out a camo invitation card template, make sure that you follow the specific color scheme that the rest of your camo-themed wedding stationeries and venue decorations all use. Doing this will help in creating a cohesive wedding event in terms of style and design – a feat that most wedding planners and brides strive for on their respective wedding days. We have already lightly touched upon this topic earlier in this article. 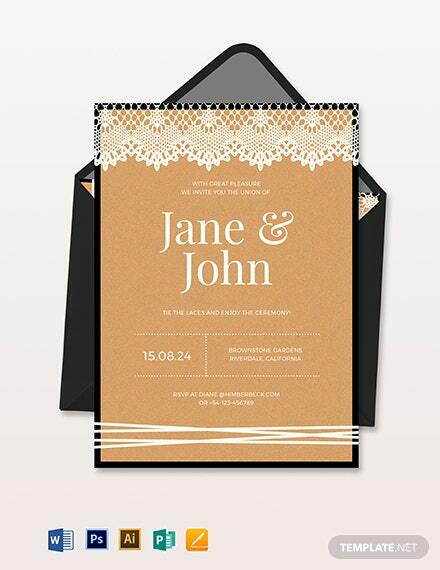 But, it bears repetition since it is one of the most important aspects to consider when selecting a pre-made wedding invitation card template. And, that is your editing skills. 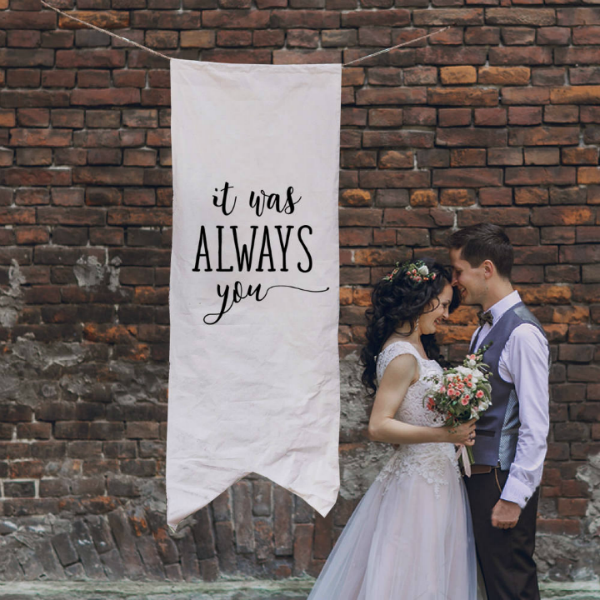 You need to know your way around different image editing and compositing software tools like Adobe Illustrator, Photoshop, and InDesign before you can satisfactorily edit any of the wedding templates that you have purchased. If you still have a lot of time to prepare for your wedding and will not be sending your invitation cards soon, then you can still learn how to use these software programs by studying through Illustrator and Photoshop tutorials online. However, if your wedding is going to be held in less than six months, you may have to double up on creating your sample wedding invitations since they need to be sent ahead of time. In this scenario, it is just not feasible to adequately learn how to use these software tools. So, it will be much better to use a ready to print template or have someone else do the template customization for you. Lastly, a factor that most couples who are planning their wedding should make sure to consider is their total wedding budget. This is can be a practical step for most couples unless you are already rich and do not have to worry about money. 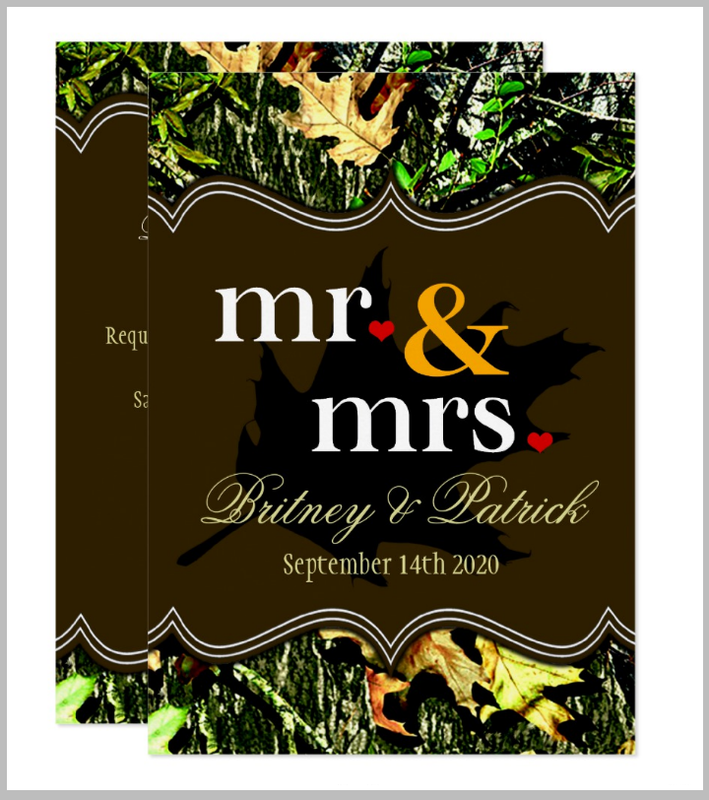 When choosing a camo wedding invitation template design, know that the template set itself will only cost less than $50. This can be considered a spare change for some. However, the real expense lies in the printing of these camo invitation templates and all the other wedding templates that will be needed for your wedding. This cost will even increase if you are going to invite a lot of people to the wedding ceremony and reception. So, if you are on a tight budget, make sure that you have already accounted for the printing and template costs. A cost-effective workaround will be to choose a modern wedding invitation template that sports a good monochrome color palette. This way you do not have to pay more for printing in color and you may even use regular or less expensive paper as a way to cut down on the printing expenses. The list of factors that should be considered prior to purchasing a camo wedding event invitation template is not an exhaustive one. There may be factors or aspects that will only apply to your specific situation. So, feel free to adapt this criteria list to your own personal experiences. 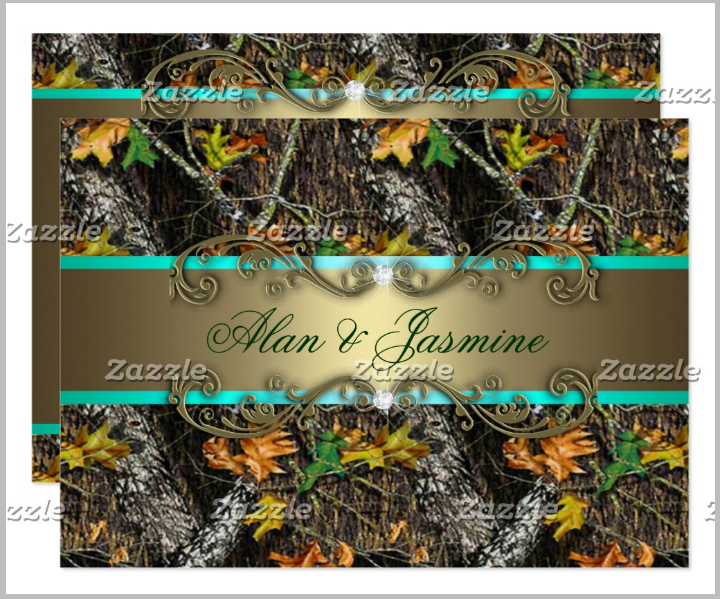 Have You Chosen a Camo Wedding Invitation Template? A camo wedding theme is definitely a unique theme to have since it subtly incorporates serene and rustic countryside scenes on top of the roughness of the outdoors. That is why this type of wedding should be held in a garden, on a farm, or even in a quaint barn where you can properly show off all your camo wedding background decorations with your other wedding stationeries like your camo wedding invitations cards. And, hopefully, you have already chosen which camo wedding invitation card template to use for your own wedding with the help of this article. Bookmark and share this article with your friends and colleagues so that they too can plan their own camo-themed destination weddings.